See the diaphragm and how it is broken. Anyone have any of these or know where I can find some? Any help would be appreciated. The horn pictured above is complete and works well. 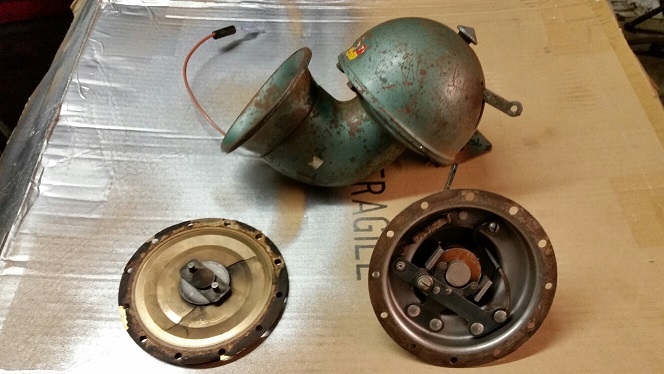 The two pieces below the complete horn illustrate the main assembly with the rheostat and the broken diaphragm. This seems to be a common problem as I have several with the same issue. But what a unique sound when one is working properly! Horses and cows are not impressed when these are blown in there direction! My wife had such a horn on her '25 Coupe and was raised/lived in a "dairy" valley - boy, could she "get the cows to come home" ! For old car horn repair contact Larry Rose. He's the owner of Moonshine County Antique Auto Horn Repair. He repaired the horn on my 24 T Coupe. good work and fast turnaround. Thanks. I have sent him an e-mail and will wait for his reply. Any others with info would be appreciated. Tom, I found out about Larry on the forum last year. There may be others who specialize in old horns but I never found any. I bought a replacement diaphragm from Fun projects and replaced the broken one on my T battery horn. Larry repaired the points on it and finally got it to work. Hope you have good luck with yours.